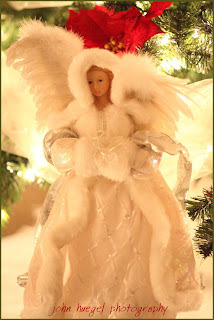 Angela wished for a bit of snow for her winter wedding, and she was not disappointed. Starting at Coventina Day Spa, the ladies prepared for the wedding. 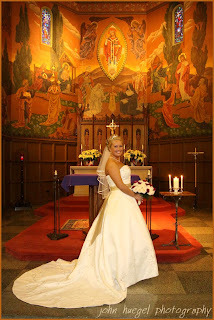 A lovely ceremony was held at the Mercyhurst Chapel, where the colors of this wonderful church accented Angela’s beautiful dress. Following formal portraits and some chilly outdoor bridal party photographs, the reception followed at Union Station. The decor restated the colors of champagne and wine, and married them with the colors of the holiday season: green, gold and white lights galore. 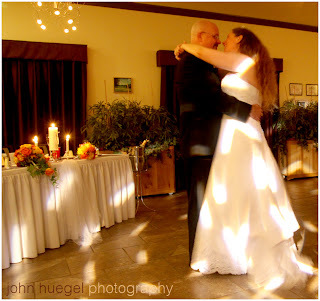 Angela and John, congratulations on your beautiful wedding! Thankfully, Saturday October 10th found a break from the rain. Dawning gloomy, it turned into a perfect October afternoon for Kristie and Garrett’s wedding in Lawrence Park. 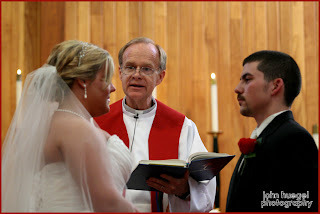 Here is an image during the ceremony at the Lawrence Park United Methodist Church. Following the ceremony and formals, we adjourned for some interesting outdoor images in the park nearby the church. Then, we headed to Capers for the reception. This is a very well decorated reception hall, featuring the works of many local artists. It lends a very classy look to any wedding, and their catering menu is very sophisticated and tasty. 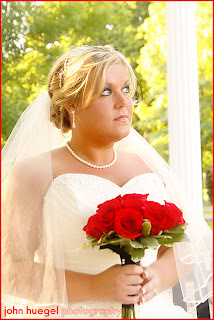 Kristie and Garrett: Congratulations! Thank you, and we wish you the best! 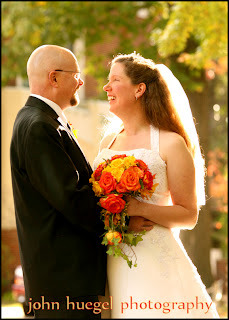 Here are some images from Chris and Lisa’s outdoor wedding. The ceremony was held at Perry Monument, and we stopped at several locations on the beach for photos. We took many images at the “kite beach”, where the bridal party got a bit sandy, and I lay on my back in the sand to get my killer images. 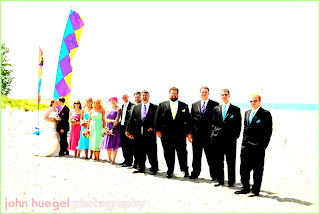 Here is a great image of the bridal party among the kites, with a bit of post processing. The bride and groom are very fond of bicycles. The theme on their cake and in the decor was all about bicycles. Here is the tip top of their cake. Chris and Lisa, thanks and congratulations. Some more great images are forthcoming! 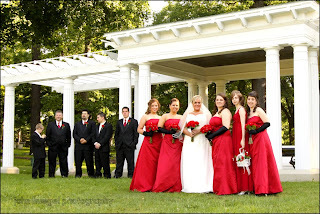 Here are a couple of images from Larissa and Ray’s wedding this last weekend. 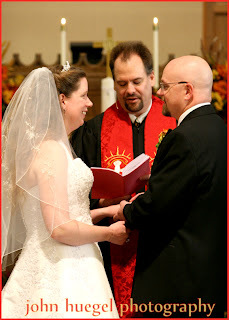 They had a wonderful service, some great weather for outdoor images, and a fabulous reception at the Mannerchor club. I put a lot of thought into my offerings for weddings this weekend. I have completely revamped my wedding pricing and offerings, and in the process, I put together this list of tips that a bride can use when choosing a photographer for her wedding. 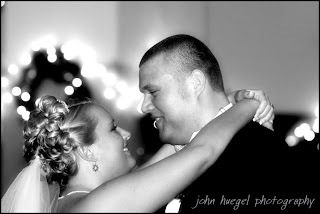 This image is a great shot of Jen and Ryan from this last March. 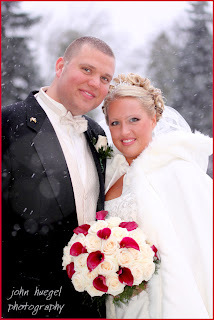 Their winter wedding was as close to perfect as you could get – weather, schedule, accommodations and everyone’s spirits were great! So here is my list of tips, available also as a PDF from my website. 1.Style. You will need to be familiar with the photographer’s work to see if it matches your expectations. Some shoot in a photojournalistic style, where they do not stage a lot of action and try to capture the day as a series of images. Some are more forward and direct and organize the shots. Some have very traditional framing, while others utilize interesting camera angles and perspectives. Some stick to traditional color editing while others lean toward more effects, black/white or sepia. You can get a certain amount of flexibility from a photographer, but do not expect a photographer whose style does not match your needs to be able to change drastically. 2.Personality. You will be spending a lot of time with this person, so you will need to be very comfortable with him or her. 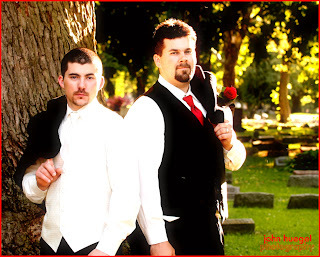 Make sure that your family and the photographer will be compatible. Do you develop a rapport with the photographer on the first call or meeting, and feel good when you hang up the phone? 3.References. The best references come from people who have used the photographer. If you heard about them through friends, they come highly regarded. If you found them through a search, ask to see sample images and talk to brides or others for whom they have worked in the past. 4.Coverage. Be clear about how much time you will need for coverage. Include your morning “getting ready” time, preparation at the ceremony location, formals and other bridal images and reception time. 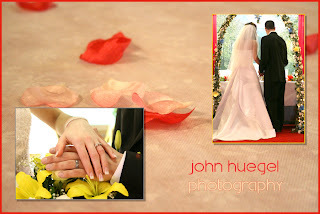 Share your time line so the photographer knows how match their services with your expectations. 5.Offerings. Some photographers only offer “shoot and burn”, meaning you are left to weed through hundreds of raw images and decide what to do with them. Others offer only printed products, and often produce excellent quality prints and albums. Still others may offer both prints/albums and digital files. Think about what you would like, and be honest about whether you will actually produce a good representation of your wedding with just the digital files. Take caution in thinking that a local digital lab will make images with the same quality as a professional photography lab, which color balances the images and uses high quality non-glossy printing processes. A few dollars saved may cost you a lot of satisfaction in the long run. 6.Pricing. It is hard to compare photographers’ offerings to each other. In order to do so, you may want to define a couple of scenarios and ask the photographers to price them to the best of their ability. Be cautious here as well: The cheapest photographer may not be the best. You will want to find your mix of value, quality and product offering. 7.Product Choices. Look for a range of products from prints to canvas products to a large selection of books and albums. Even if you are interested mostly in digital prints, it is highly recommended to choose a photographer who can produce good large prints and albums, because their experience in making these images indicates they have the skills and resources to produce good products, whether they are electronic or printed. Plus, you may change your mind later and want a professional album. 8.Digital Files. 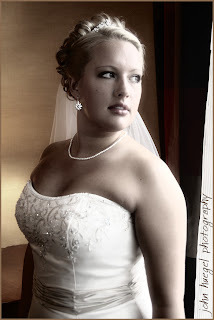 Many brides today are looking for access to the images. Many photographers offer this service. Ask whether the images will be edited or raw, and what degree of editing will be performed. What size or resolution will be offered. Will a release be granted to let you print them at a lab? Are there any restrictions on your use of the images? Most photographers will retain the copyright and ownership and grant you a license for private use. That is normal. 9.Credentials. Does the photographer belong to any professional associations? Are they insured with liability coverage? Do they have a particular education or certification that you are looking for? Credentials are not everything, but they do indicate whether the photographer is actively growing and experimenting with new techniques. 10.Lifetime Relationship. You may not think of this now, but the photographer you choose may be the same one who takes you maternity and baby pictures, family portraits and perhaps even your childrens’ senior portraits in 20 years! Choose your photographer carefully!